Do you feel like your morning is incomplete without bacon? If so, you just might want to consider signing up for one of these awesome bacon of the month clubs. Each one provides something different — from classic favorites to truly unique flavors you definitely won’t find at your local grocery store. What’s more is you’ll become a bacon expert by sampling selections from artisanal bacon-craftsmen all across the United States. The only challenging decision is going to be picking which monthly club you’ll sign up for! Luckily, we’re making it a little easier for you by sharing what you need to know about these nine bacon of the month clubs so you can see which one is the right fit for your bacon loving taste buds. For anyone who enjoys having a few slices of bacon with their breakfast (or any meal of the day) they’re going to love what Bacon Freak has to offer. They provide a pretty extensive selection of bacon from locations around the United States, including the deep south, the Eastern mountain range, and the Midwest. Each one offers their own distinct style and taste. You’ll be able to purchase wet cured, dry cured, and uncured bacon all from Bacon Freak’s online shop. Their bacon is never injected with water during the curing phase, unlike most of the bacon you’ll find on store shelves. Instead, they spend weeks carefully dry curing most of their bacon. It’s also smoked with hardwoods such as Maple, Hickory, and Applewood. Some bacon is seasoned with spices for an added dose of flavor. When browsing their selection, you’ll find plenty of great options such as: Boss Hog Hickory Smoked Bacon, Boss Hog Honey BBQ Rubbed Bacon, Coastal Caliente Jalapeño Bacon, and Bacon Freak’s Everything Bacon. They also offer no-nitrate options for those who choose to avoid it in their bacon. Besides just bacon, you can also snag some bacon-flavored seasoning, the Makin’ Bacon Pancakes Bundle, and so much more. If a monthly delivery of bacon sounds like a dream to you, then you’ll want to check out BAC’N. They allow you to purchase individual items from their shop or you can choose to sign-up for recurring monthly deliveries. With a monthly subscription, you’ll receive two packages of America’s finest artisan bacon and a BAC’N logo t-shirt to wear and make your friends jealous. The best part of using BAC’N is that you’ll be able to try a wide variety of tasty flavors. They offer apple cinnamon, applewood smoked, cajun style, chipotle southwestern, hickory smoked, honey BBQ, mesquite, sun-dried tomato, and a ton of others. They also offer no-nitrate options. With so many different flavors to try you might have a hard time making your BAC’N stash last the entire month! How would you like to add a little gourmet bacon into your life? If that sounds like it’s right up your alley, Bacon Scouts has an impressive bacon selection that’s sure to make your mouth water. When you join their bacon of the month club, you’ll receive recurring deliveries of bacon that are exclusive to Bacon Scouts. That means you won’t find this selection anywhere else (online or in stores). Each order comes with a unique, gourmet bacon flavor as well as a classic style such as hickory or applewood smoked bacon. You’ll be able to enjoy two pounds of bacon each month, which is sure to liven up your breakfast every morning. If you’re curious what those unique flavors will be, you can expect to find Raspberry Chipotle, Apple Cinnamon, Honey Barbecue, or Cajun Style bacon inside your box. Other flavors you’ll have the chance to discover are the Chipotle Lime and the Tangy Dill Pickle Hickory Smoked Bacon. It’s safe to say joining Bacon Scouts will have you experiencing all kinds of different bacon flavors. Known for having all kinds of monthly clubs that provide gourmet gifts, it should come as no surprise that Amazing Clubs has one all about bacon. Each month, you’ll receive a delivery that features a selection of thick-cut, artisan-style bacons. They all come from specialty, gourmet butchers across the United States. You’ll receive two new flavors to try each month, coming in at one pound each. All of the bacon they provide is made with only all-natural ingredients, so you can feel good about eating it as well. Past boxes they’ve delivered included selections such as: Cast Iron Kitchen Chipotle Rubbed Bacon and Hickory Acres Farm White Truffle Sea Salt Bacon, Oaken Barrel Sea Salt & Cracked Pepper Bacon and Pork & Jazz Company Jalapeño Honey Bacon, and Dream Meats Apple Pie Bacon and Richard’s Family Garlic Basil Bacon. If chefs like Michael Symon and Bobby Flay love Zingermans’s Bacon Club, it has to be good, right? Each month, you’ll receive a shipment of 12 to 16 ounces of artisan bacon. Plus, you’ll find bacon stories, histories, and recipes inside your box as well. And with your first order, they’ll throw in their Bacon Booklet and a pig magnet. Before ordering, you’ll be able to see the line-up for the year ahead. You can choose to get three months of bacon, six months, or for the full year. Their selection includes delicious flavors such as: applewood smoked bacon, Kentucky dry cured bacon, Arkansas peppered bacon, Balinese long pepper bacon, and more. With Pig of the Month, you’ll receive two different flavors with every delivery for as long as you’d like to receive them. Their flavors change seasonally, which provides you with plenty of variety. There will be more unique flavors, as well as classic favorites that you’re used to enjoying. Combinations you might find in your order include: BBQ Rubbed and Apple Pie, Citrus Sugar and Cracked Pepper, Bloody Mary and Garlic Basil, Summer Herb and Everything Bagel Bacon, and Pumpkin Spice and Chili Ranch. If that doesn’t leave your mouth watering, we don’t know what will! You can also get a selection of artisanal bacon delivered to your door when you sign up for Bacon Buff. They deliver only pure, high-quality bacon from makers all across the United States. It will provide you with plenty of variety, so you never have to worry about falling into a bacon rut! Every morning will be a treat with another flavor to try. Inside your box, you could find bacon from bigger name brands, alongside bacon from smaller, family-run farms. And instead of getting the same bacon with different rubs each month, you’ll get to experience bacon from diverse bacon makers that absolutely love what they do. Besides getting delicious bacon each month, you’ll also receive extra treats like shirts and stickers so you can share your love of bacon with the rest of the world. You’ll also get access to recipes and and exclusive deals that allow you to save on bacon, meats, sauces, rubs, and other products. Before you know it, you’ll be a Bacon Buff in no time at all! If you’re a meat lover, there’s a good chance you’re familiar with ButcherBox. They offer a wide variety of cuts of meat, from beef to pork and chicken. They deliver 100% grass-fed beef, free-range and organic chicken, as well as heritage breed pork. Everything gets sent straight to your door, making it incredibly convenient for you to eat high-quality meats on a daily basis. For anyone who chooses to join ButcherBox, you’ll want to make sure you add some bacon to your order. It’s actually so popular that it tends to sell out, but it’s worth getting your hands on it. 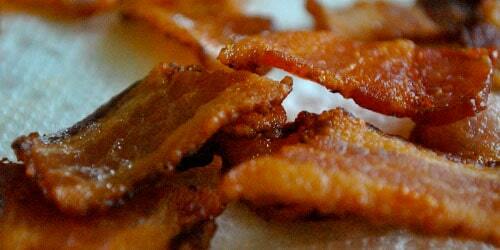 Their bacon is sourced from slow-growing, minimally processed pigs. It’s also uncured, nitrate-free, and sugar-free. That means you can feel good about the bacon you receive in your order and it’ll make the perfect addition to any meal you have. ButcherBox is a great way to go for anyone who isn’t interested in the different flavors other monthly clubs provide, but instead wants something simple and classic. And finally, bacon lovers will also want to check out Tender Belly and their monthly deliveries of bacon. With every order, you’ll receive four one-pound packages of Tender Belly signature bacon to satisfy your cravings. You’ll be able to enjoy their dry-cured, cherrywood-smoked bacon flavored with their signature maple rub or spice things up with their Habanero mix. If you’re avoiding sugar, they also have a sugar-free option you’ll enjoy. Their available flavors include: the Signature Dry Rub Uncured Maple Bacon, the Signature Dry Rub Cured Maple Bacon, Signature Dry Rub Uncured Habanero Bacon, and the No-Sugar Dry Rub Uncured. So, bacon lover… Which one of these monthly clubs will you be signing up for? Will you choose to go for something with classic flavors or one that will have you stepping outside your comfort zone with unique flavors? Let us know in the comments below!